Services Include: New Screens, Screen Repairs, and Screen Cleaning. New Screen Installs – We design, fabricate, and install a variety of screens, including insect, pet, and solar screens. Screen Repair – We can repair or replace existing screens, including fabric, frames, corners, sliding screen doors, and hardware. Screen Cleaning – We deep clean and maintain your screens to ensure maximum durability and long-lasting beauty. We provide homeowners with a “turnkey” solution to meet their needs. ClearPro Window & Carpet Cleaning has the skill and expertise to recommend, custom measure, fabricate, and install new screens. No job is too small or too large. Insect Screens: Insect or bug screens are commonly used for windows that slide or crank open. 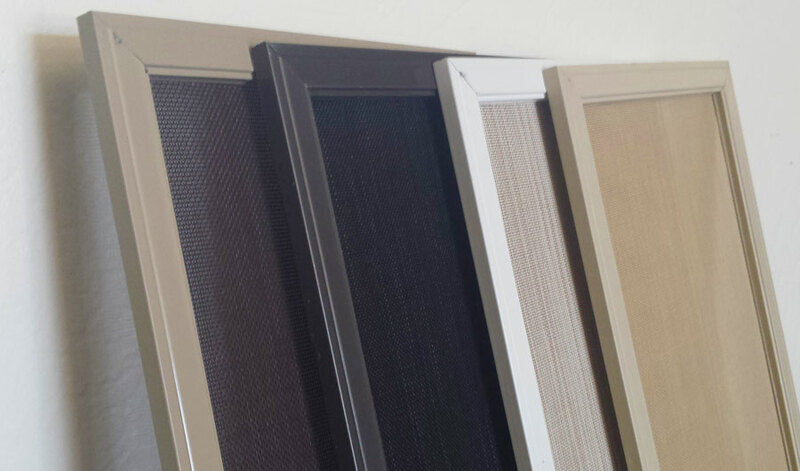 Insect screens are traditionally mounted inside the frame. This screen allows the window to be open without the worry of any flying critters getting inside. The fabric is almost invisible to the eye. 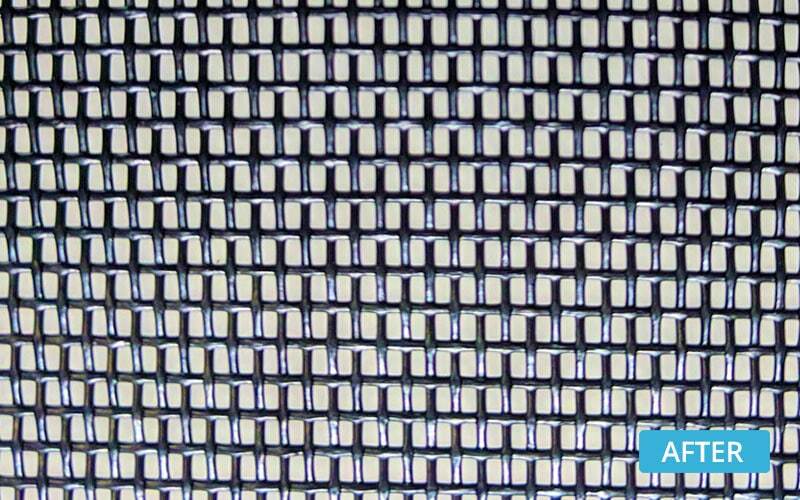 Pet Screens: Pet screens are fabricated with a heavy-duty fabric that is much more durable than insect screens, and resistant to damage caused by dog and cat claws. Pet screen fabric is a popular choice for patio slider screen doors and for personnel screen doors. 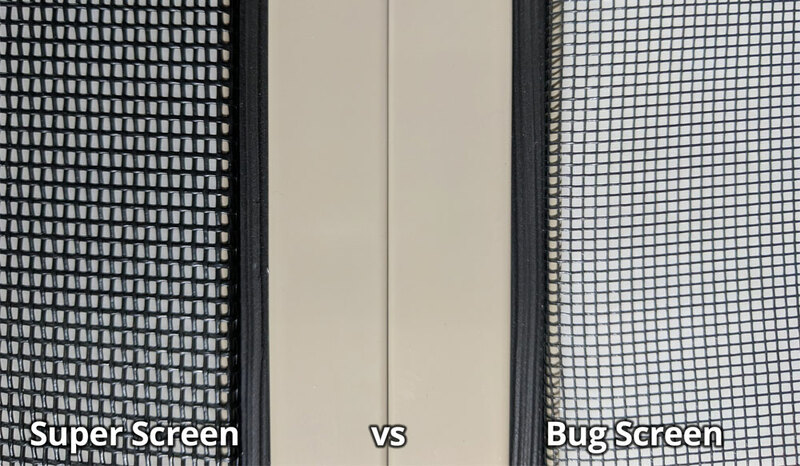 Super Screens: Super Screen fabric is a step up from standard insect screen fabric, and provides increased durability and longer service life. The fabric is also heavier and slightly darker than insect screen fabric. Solar Screens: Installing solar screens (commonly called sunscreens) on a home or office can slash annual cooling costs by up to 20%! Solar screens are perfect for windows, doors, and skylights. 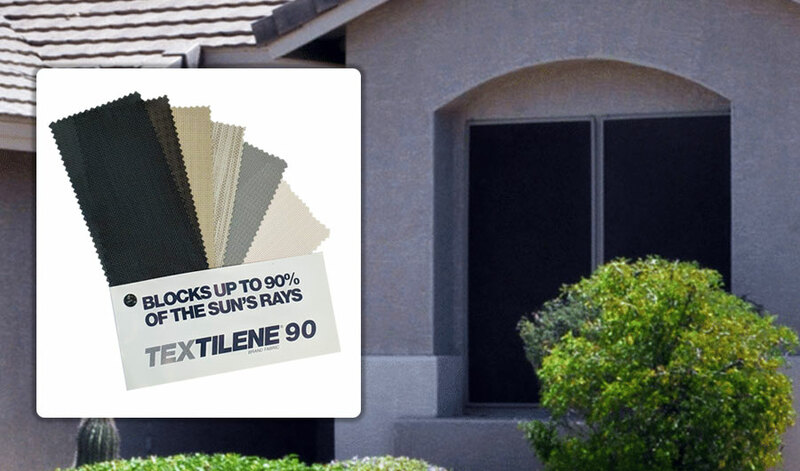 They block 80% to 90% of the sun’s harmful UV rays, reduce glare, and provide daytime privacy. Solar screens are mounted on exterior window frames, but the fabric never directly contacts the surface of the glass, stopping heat before it reaches the glass. These screens use a tighter weave and heavier fabric material made of a woven PVC-coated polyester yarn specially formulated to withstand UV rays. The solar screen fabric is darker than others screen fabrics and does reduce visibility when looking through the screen. Repairing existing screens is often significantly cheaper than fabricating new replacement screens. ClearPro will provide a free quote following our free on-site consultation. This quote includes repair/replace recommendations that best fit your budget and needs. ClearPro uses the best-quality materials to ensure your screens will look and work great for many years to come. Plus, our customers appreciate our all-inclusive pricing: our quotes always include pickup, delivery, and remounting. Regular cleaning and maintenance of your screens will ensure maximum longevity and long lasting beauty. ClearPro has tested various methods of cleaning. The method we have adopted is by far superior to other methods used by other window cleaning businesses. Here’s what our testing revealed. Procedure: Use a low-pressure nozzle to wash both sides of the screen. 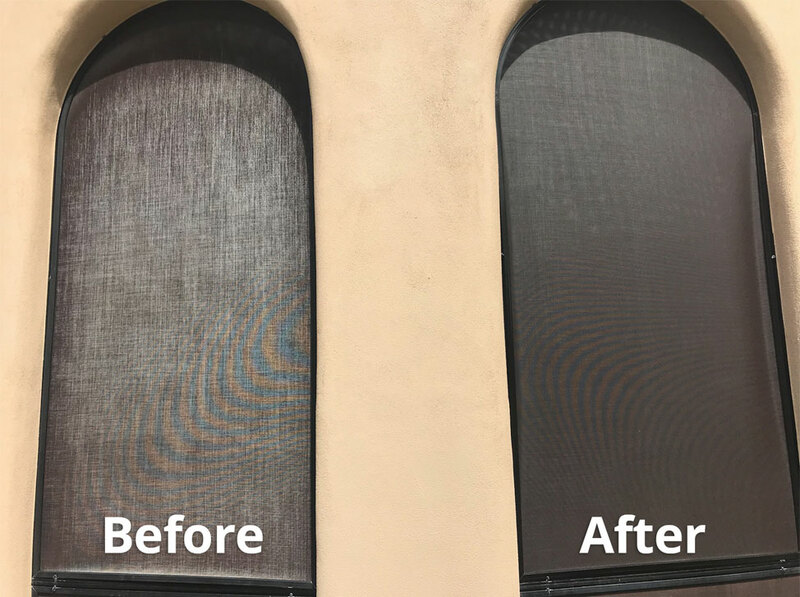 Effectiveness: Pressure washing with water only does not clean screens because ‘water only’ does not break the bond that exists between the screen fabric and the dust, dirt, and oxidation. Procedure: Alternate brushing both sides of the screen until the loose dust and dirt is removed. 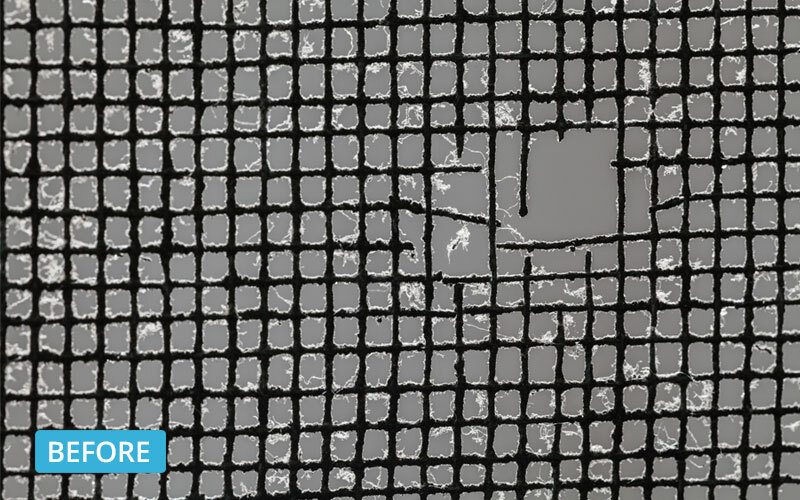 Effectiveness: Brushing screens is an inexpensive way to remove loose dirt and most dust, but does not remove oxidation and the dirt tightly bonded to the screen fabric. Procedure: Use white nozzle to apply a mild detergent to both sides of the screen. Use a low-pressure nozzle to rinse both sides of the screen. Effectiveness: Using a mild detergent in combination with pressure washing removes loose dirt and dust, but does not remove oxidation and dirt tightly bonded to the screen fabric. Effectiveness: This is ClearPro proprietary technique which removes all loose dirt and dust, but more importantly it also removes the dirt and oxidation tightly bonded to the screen fabric. This technique leaves your screens smelling clean with a pleasant citrus aroma and looking SPARKLING CLEAN!! leaned screens act as a natural barrier that reduces the penetration of windblown and rain carried dust and dirt that normally settles on the exterior of your windows over time.